Did you abandon your good old Joomla 1.5 RapidRecipes website to move forward to a brand new Joomla 3 website? Rapid Recipe to NS Recipes Migration. Categories, recipes, pictures, videos, favorites, and comments are migrated. Simulation mode to simulate a migration. DB tools to delete RR and YR data. 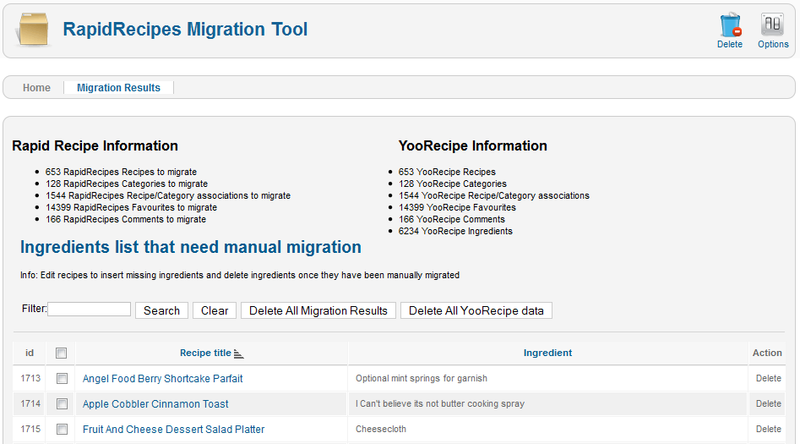 Manual migration is eased thanks to a migration results screen that helps you edit recipes in order to add non-migrated ingredients. Categories are migrated, but in a flat way. ie, no parent/children relationship is kept. This part of the process remains manual. YR Fields cannot be populated: nutritional information, cooking time, wait time, preparation time. Ingredients are migrated, but with no unit. 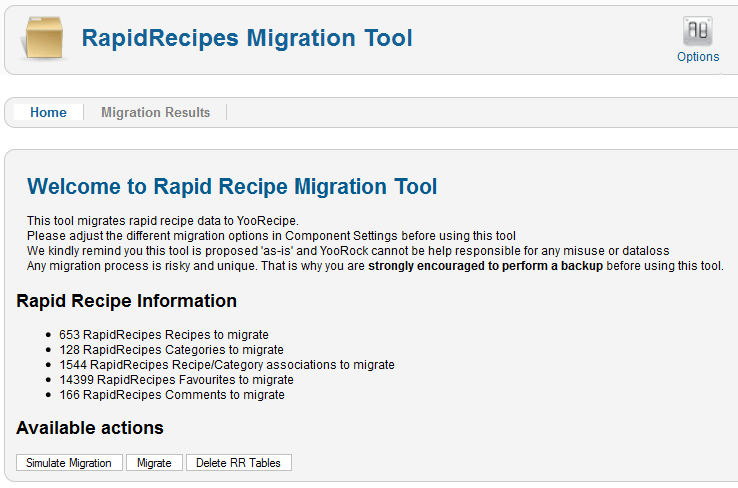 Note: Ingredients that cannot be migrated are stored into the database for manual migration. Manual migration is eased thanks to a migration result screen that helps you edit recipes in order to add non-migrated ingredients. RRMT can be installed like any other Joomla extension. You should see an "ok" message stating the component has successfully been installed. RRMT is made of two menu items: Home and Migration Results. Also includes a settings panel. You should adjust Component settings before any migration attempt or simulation, as RRMT gives you the opportunity to decide what should be done with your RapidRecipes data. If set to yes, then NS Recipe's description field is filled using the RapidRecipes Pretty URL field. If set to no, then default Joomla alias is used. Set the rapid recipes field used to fill in the NSrecipes description field. Can be metadesc, introtext or recipe_comment. RapidRecipes uses a recipe comment field that has no equivalent in NS Recipes. This option makes it possible to append the RapidRecipes Recipe Comment text immediately after the NS Recipe's preparation field. RapidRecipes stores complete HTML code for videos, while YooRecipe only stores the youtube video id. This option makes it possible to append the HTML video code immediately after the NS Recipes preparation field. If your NS Recipes pages should be indexed by crawlers. The main screen displays information about RapidRecipe database contents and the list of available actions. RRMT will not migrate data, but only display the simulated migration results. Depending on how you setup the component, the list of non migrated ingredients is likely to evolve. As it stands, delete all rapid recipes tables. This action is irreversible. We strongly recommend you to perform a database backup before using this tool. If you see an error screen, please double check the prerequisites list described above. As a reminder, RRMT needs RapidRecipes tables and NS Recipes Component to be installed. Once you are done with component settings and simulation, you can proceed to migration. The migration process might take up to 5 minutes depending on how much data needs to be migrated. The process is fully AUTOMATIC. Once you launched the migration process you MUST WAIT UNTIL REDIRECTED TO THE RESULTS SCREEN. Once the migration is done, some ingredients may not have been migrated. This screen displays the migration results and useful information about data migrated. Ingredients that have not been migrated are listed. The manual migration process is eased thanks to a direct link to NS Recipes recipe. By doing so, you can finish the migration process at your own pace. Tip: Once you add the missing ingredient(s) to the recipe, you can delete it/them using the delete action displayed in the last column table.